Gabriel Castilo, maintenance foreman, and Mike Freeman (right), owner of Red Valley Landscape & Construction in Edmond, Okla.
Profits and employee engagement can soar when you reward your employees. The landscape industry’s employee woes typically center around recruiting and retention, but many experts say business owners should really be concerned about engagement. According to a study from Gallup, companies with highly engaged employees outperform those without by up to 147 percent in earnings per share. Meanwhile, this same study found that just 13 percent of the workforce is truly engaged at work. Incentive programs are one way to cultivate engagement. Carolyn Kurowski is the senior vice president for FMP Consulting, a management consulting firm that, among other things, helps organizations implement effective incentive programs. That said, a poorly structured employee incentive program is going to fail, waste time, cost money and diminish trust in the systems and processes that leadership puts in place going forward. Successful programs typically share four primary characteristics: They are simple, meaningful, timely and public. First, simplicity is essential. Programs fail when companies take on too much, too fast, says Kurowski. Complicated programs are difficult for employees to comprehend and difficult for managers to control. The program should be easy to sustain because the goal is longevity. It’s only over time that executives will see the fruits of their labor. “It’s important to think about what you can afford, what you’re going to be willing to do on an ongoing basis and what you’re willing to commit to,” says Kurowski. It’s also important for the program to matter to your workforce. Monetary compensation is common in employee incentive programs, but Kurowski says a gift card or an employee-of-the-month parking spot can go a long way for a program in its early stages. The reward also should be closely tied to the desired behavior, so Kurowski emphasizes timeliness. She too often sees well-intentioned executives lose track of their incentive program for months at a time and then try to play catch up by handing out a bunch of checks or gift cards all at once. This huge gap of time between the behavior that’s being rewarded and the reward diminishes the program’s effect. If your reward system uses gift cards, for example, be sure to have the gift cards on hand so employees can receive their rewards the week or even the day they earned them. This approach helps reinforce the desired behavior and keeps you up-to-date with your program. Finally, great employee incentive programs are public, Kurowski says. Some programs even can become self-policing when teamwork is involved or when the score is kept publicly. Some companies honor employees who earn incentives or receive positive feedback from customers on their websites or through social media posts. This concept not only makes employees feel revered, but it also works as a content marketing strategy. “It serves as a dual purpose because potential customers are hearing positive feedback about employees, sometimes even from other customers,” she says. Armed with this knowledge, let’s look at a few case studies from landscape companies that have implemented simple but effective employee incentive programs. Owner Mike Freeman wanted field employees from the lowest level to the highest level of the organizational chart to see how their decisions affected the company. So, two years ago, he created an incentive program that displayed the butterfly effect of employees’ actions—and one that rewarded them for creating positive waves. “(The incentive program) opens them up to see that everything they do—whether they make a wrong decision or a positive decision—affects the bottom line,” says Freeman. Employees have two ways to earn extra money under Red Valley’s incentive system. The first, and more simple way, is through the company’s recycling program. Previously, the company had a problem with employees improperly disposing of items like pallets or plastic containers. Not only is it a concern to leave litter on a property, Freeman says, many of these items carry deposits, allowing the company to get money back if it returns them. The ones that can’t be returned for deposits can be sold or recycled. Now, any money the company earns by recycling or returning refuse is entered into a pool. At the end of the year, the money is dispersed to all members of the production crews. From there, a hierarchy exists where the higher members on the organizational chart earn more than the lower level guys. Top tier production crewmembers can earn an extra $1,000 to $1,500 from the recycling program alone. Less tenured employees earn about an extra $300 or $400 per year through this program. Red Valley employees also can earn extra money based on productivity. The company tracks the total hours spent on the job. It also tracks each task on the job and ties it to a specific worker or set of workers to see if each employee is completing his or her tasks within a given time frame without sacrificing quality. If the employees are hitting their productivity goals and the job’s gross profit margin is on target, the workers get a cut. Red Valley’s goal per job is 50 percent gross profit margin. If it hits this goal, 1 percent of the earnings from that job go into a pool. If the company hits only 40 percent gross profit margin, only a half percent goes into the pool. If it goes above 50 percent, the percentage goes up. The pool contributions typically fall between a half percent and 1 percent, Freeman says. Productivity is determined per job for a design/build or irrigation project and per account for maintenance or tree care. Often, a few hundred dollars is given back per job or account. The earnings are paid at the end of each quarter. Like the recycling program, incentives are doled out on a sliding scale based on seniority. Freeman says the program is self-policing with the high-level employees—the ones that stand to earn the most money—leading the lower-level employees to more profitable behaviors. “What happens is the guys that really buy in to the program make sure that the other guys that aren’t necessarily on board as much as they are, they’re getting them on board,” Freeman says. Not surprisingly, getting employees on board is the biggest hurdle. At first, Freeman says, the weight of simply knowing they stand to earn a percentage didn’t really click with many employees. Now, the company talks about its program during weekly “tool box talks,” where they discuss successes, failures and areas that need improvement. At the company’s quarterly meetings, Freeman gives employees printed reports stating how much they’ve earned so far that year as well as an update on where the company stands as a whole. Once they watch that account grow, it doesn’t take long for the program to click, Freeman says. “When they start seeing thousands of dollars in this account that goes back to them at the end of the year it really opens their eyes,” he says. Mark Borst, president of Borst Landscape, was struggling to keep his jobs within their budgeted hours. His crews had no incentive to come in on time, and there was no consequence if they went over budget. Beginning three years ago with the company’s maintenance crews, each crew is given a set number of hours to complete their duties at each site. If the crew hits its benchmark, each member receives an additional $50 that week. Having crews aim for speed might worry some contractors. It scared Borst, too. So, he added a catch. If a client calls back because the job wasn’t done correctly, the crew must return to fix it. The additional time spent cuts into the following week’s allotted time—which almost ensures the crew won’t get its bonus that week. Even the simplest plans aren’t foolproof. At first, the company based the program on production time alone, excluding drive time. If the employees knew they were going to exceed time on a certain job, they’d simply add an extra five minutes to their travel time to give themselves some wiggle room. Now, they’re given a fixed number of hours for the week—travel time included—which removed that workaround. Landscape looks at its job costing to see if its construction crews were on budget in hours and materials used. If they were and the job was profitable, the crew gets an extra 2 percent of their monthly salary tacked onto their paychecks. When Mark Borst tells peers in the landscape industry about his incentive program, he gets a familiar response. “Friends in the industry criticize me, ‘Why are you rewarding them for doing their job?’” he says. But Borst says he actually saves money on the program. The extra $50 a maintenance crew member might make is cheaper than the overtime that went along with jobs coming in over budget all the time. He estimates he was paying an average of $75 per employee for overtime. Plus, he says rewards work much better than consequences. 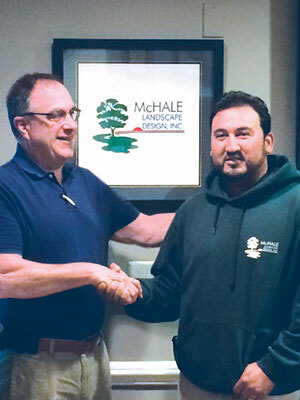 McHale Landscape’s Kevin McHale believes employee’s financial returns should match the value the employee is providing the company. Simply, if you do more, you get paid more. 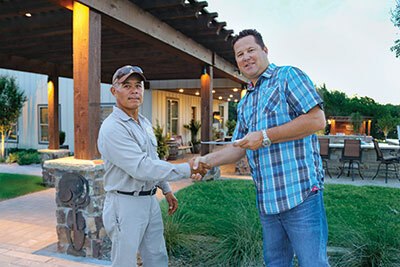 Director of Safety Mike Blade awards foreman Jaime Jimenez the company’s annual Safety Award. Naturally, the company’s incentive program follows this line of thought. Employees are rewarded when the company is successful, and at McHale, success is measured by gross margin. At the end of every year, the company compares its gross margin for the year to the previous year. For every percentage of gross margin the company improves over the previous year, it splits a quarter of that difference evenly among the foremen. For example, McHale is a $21 million company, so if it increases gross margins from the year before by 1 percent, that’s around $50,000 for about 55 foremen. This year, each foreman received about $1,000. The program’s biggest hurdle was education. If the program was going to succeed, there had to be an understanding at the field level. At first, not every foreman knew how gross margin worked. McHale explained the program as essentially a profit-sharing program. The McHale playbook also includes a safety incentive program. The company has seen a drastic cut in incidents since implementing the program. In fact, if the year’s total worker’s comp claim exceeds that of the previous year’s, the reward from the sinking fund is cut in half. McHale says taking it all would discourage safety once employees knew they wouldn’t reach their goal that year, but he says it’s important to strive for safety as a company. Because safety issues are often obvious and out in the open, crew members give each other friendly reminders, rather than management having to do it, because the crew members don’t want to lose their bonuses. Both programs have a team aspect that brings unity to the crews. Engagement has never been higher, McHale says. While incentive programs are designed to change employee behaviors and put a few extra bucks in their pockets, many business owners say they also benefit companies by helping recruiting and retention efforts. Furthermore, McHale Landscape owner Kevin McHale says incentive programs help attract career-minded people during the recruiting process. If an employee gets excited and understands the value of being a part of an incentive program, he or she is likely a desirable candidate for the company. “The type of people that understand it are the type of people we want to attract,” he says.